This week's menu was mostly dictated by my very full freezer. It's time to get rid of some of the meat I've been stockpiling! It is a great way to get some variety in your diet, too. We've got pork, chicken, turkey, and a veggie meal this week. 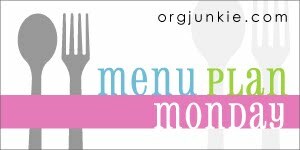 You can share your own menu and check out more over at Menu Plan Monday.